The CSU Council today announced the election of Dr Michele Allan as the University's third Chancellor. Dr Allan will take up the position on Wednesday 3 December 2014, following the retirement of Chancellor Mr Lawrie Willett, AO at the end of the year. 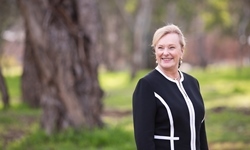 The Charles Sturt University (CSU) Council today announced the election of Dr Michele Allan as the University's third Chancellor. Dr Allan will take up the position on Wednesday 3 December 2014, following the retirement of Chancellor Mr Lawrie Willett, AO at the end of the year. Dr Allan is currently Chair of Meat and Livestock Australia (MLA), the William Angliss Institute and the Grains and Legumes Nutrition Council, and is on the Board of Directors of Innovation Australia, the Cooperative Research Centre for Hearing and Tasmanian Irrigation Pty Ltd. She is also currently chairing the Tasmanian Fruit and Vegetable Taskforce, appointed by the Federal Minister for Agriculture, The Hon. Barnaby Joyce. Chancellor Willett said "I would like to welcome Michele to this very important role". "I am particularly pleased that the next Chancellor will continue the tradition of Charles Sturt University in appointing experienced leaders with a strong understanding of the challenges and opportunities facing rural and Indigenous Australians," he said. CSU Vice-Chancellor and President Professor Andrew Vann said, "This is a challenging and exciting time for Charles Sturt University". "We are the largest regional university, and the biggest provider of online education, in Australia," he said. "Michele's extensive board experience, and her industry background, will give us an edge in meeting these challenges and exploiting the opportunities ahead. western and south western NSW." CSU Deputy Chancellor Ms Kathryn Pitkin, who chaired the Chancellor Search Committee, said, "Dr Allan is an outstanding candidate, and brings to the University a deep understanding of rural, regional and Indigenous education, as well as regional industries". "Michele is highly regarded in industry and government, has a strong strategic outlook and a deep respect for the academic, research and rural mission of the University. She will bring new thinking and approaches to ensure the University continues to be a key force for good in our regions," Ms Pitkin said. Dr Allan described the new role as a deep honour. "I have great respect for the excellent work Lawrie Willett has done as Chancellor in guiding the University through a period of rapid growth," she said. "I will enjoy the opportunity to work closely with him as I prepare to take on the role in December. "I know the Council was conscious in appointing a new Chancellor that it was exercising a responsibility not just to the University, but to the regional communities that rely upon and benefit from the work the University does. "Regional universities play a critical role in their communities. We not only provide opportunities for rural and Indigenous people, we are also the key to ensuring regional labour markets have the skills and innovative capacity to compete and grow in increasingly national and global markets. "I have always been impressed by the quality of the Charles Sturt University graduates, and this reflects the University's commitment to preparing graduates for employment. This is why the employment rate for Charles Sturt University graduates is 8.3 per cent higher than the national average. "I hope to use my experience in the education sector, and in industry, to ensure that Charles Sturt University thrives in a competitive higher education market." Dr Allan will be installed as the 3rd Chancellor of CSU at a Ceremony in Bathurst on Thursday 4 December 2014. Read more about Dr Allan here. Listen to a report on the announcement here. Listen to CSU Vice-Chancellor Professor Andrew Vann talk about the announcement here.